Volkswagen AG executives are content with the automaker's performance in the United States, despite a slowdown that led the VW brand to cut its 2013 sales target. During a meeting with U.S. dealers in July, Volkswagen Group of America executives set a new goal of selling 440,000 Volkswagens this year -- up less than 1 percent from last year. VW executives had told dealers at the start of the year that they aimed to increase the brand's sales 11 percent, but sales were down 1 percent through June. That has apparently not rattled top executives in Germany, who have set a goal of increasing U.S. sales of Volkswagens to 800,000 units by 2018 as part of the company's quest to become the world's largest automaker. Christian Klingler, VW AG's board member for sales and marketing, acknowledged today during a second-quarter earnings call that the VW brand expects 2013 U.S. sales to be "on the same level" as last year. He chalked that up to structural problems that followed several years of rapid growth. VW had no strong products to introduce this year, but those vehicles will arrive in the future, Klingler said. 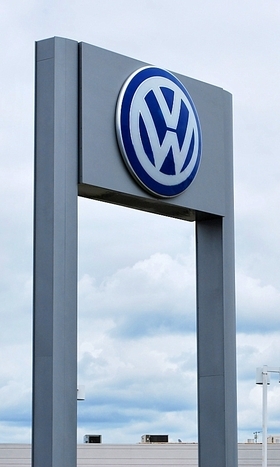 All of VW AG's luxury brands have continued growing in 2013. Audi sold 74,277 units during the first half of the year in the United States, a 14 percent increase, while Porsche sold 21,309 units, up 30 percent. Bentley and Lamborghini also boosted their sales. "We see good performance in terms of Audi, good performance in terms of Porsche and good performance in terms of Bentley," Klingler said. "I think in general, our performance in the United States is good." VW said today that its groupwide unit sales of cars and light trucks rose 7 percent in North America through the first half of the year. North American revenue grew faster than that -- up 22 percent to $13.9 billion -- reflecting VW AG's heavier reliance on Audi and Porsche luxury vehicles.